Isn’t it ironic that marketing, the one business function that is (supposedly) responsible for clear communication, is also the one with widespread confusion about the meaning of one of its central terms: brand? There are actually at least four meanings, all very different. So I’m going to begin the discussion about rebranding by clarifying some terminology. And then I’ll point out the eight foundational assets you must have for an effective “brand” in life science marketing. In future issues, I’ll cover the reasons to think about rebranding, discuss the team you need to undertake this effort, provide a decision tree that will allow you to determine whether it’s time to rebrand, and give you a roadmap to follow as you rebrand your life science organization, product or service. The question: “Is it time to rebrand?” is actually more complex than it first appears. The question of when to rebrand can be a thorny one for people responsible for marketing in life science companies. In this series of whitepapers, I’ll tackle this seemingly simple question, and show how the answers are surprisingly subtle and highly dependent upon individual conditions. I’ll provide some guidance by highlighting several different sets of conditions that would indicate the need to rebrand or—and this is even more important—the need to avoid life science rebranding in favor of more appropriate action. I have a confession: I hate the word “brand” This term doesn’t clarify, it only confuses. You’ll note that I’m using the word “brand” in quotation marks. I must start this white paper with a confession, one that will separate me from many marketers and designers working today: I hate the word “brand.” It’s one of those buzzwords that doesn’t serve to clarify, but only to confuse. This confusion seems to be global. Two months ago I was in Japan, helping an international client with some difficult (and fascinating) life science marketing challenges. While there, I was asked by several people, “What is a brand?” Significantly, this question came from people with varying command of English (halting to fluent), and from multiple levels within the company (staff engineers to directors and above). Had I been an expert in corporate finance, none of those people would have asked for a definition of “profit,” or “cost of goods sold” or any one of two-dozen terms from the finance function. And they wouldn’t have asked for definitions of common business terms from other functional areas, such as production, sales, or HR. Just what is a “brand” in life science marketing? There are four common meanings for the word “brand.” To introduce these I’m going to take a broader look at how the different components of marketing fit together. There are four common meanings to the word “brand”, all mutually exclusive. I’ve touched on both subjects elsewhere, and you can read more by following the links in the previous paragraph. There are several key points in this discussion that we’ll return to time and again as we answer the question: Is it time to rebrand? To engage this topic effectively, we need common terminology, so let’s review this briefly. The relationship between the components of life science marketing. Effective marketing is composed of five key components. You can refer to figure 1 during this discussion. First: your audiences. I use the plural form of the word deliberately, because you have many audiences, including prospects, customers, the search engines that visit your web site, and potential employees, among many other audiences. There are five components in high-performance marketing: the environment, your audiences, your touchpoints, your brand-story and your position. Your audiences exist in an environment, full of regulations, technological shifts and competitors yelling loudly, trying to get your audiences’ attention. As part of that environment, your audiences bump up against your touchpoints, as well as the touchpoints of your competitors. I’ve arranged these touchpoints along the “Ladder of Lead Generation,” with slower-acting, farther-reaching touchpoints at the top (e.g., earned exposure and content marketing) and faster-acting, more-limited-reach touchpoints at the bottom (e.g., paid exposure and outbound solicitation). These touchpoints are the ways that your audiences come in contact with (that is, “touch”) information about your organization, products and services. Therefore, these touchpoints help shape the audiences’ image of your organization, products and services. If your marketing is going to be effective, these touchpoints must all convey your unique value in a consistent fashion. This consistent articulation of your unique value is sometimes called your “brand,” but because the word “brand” is confusing at best and puts too much emphasis on the visual part of your communication, I refer to this as your brand-story, which is a distilled visual and verbal articulation of your position. Your brand-story distills and articulates your position, an idea that represents the choice of attributes that you want your audiences to associate exclusively with your offering, organization, services or products. Your position must meet seven key criteria: it must be clear, unique, authentic, sustainable, important, believable and compelling. When your marketing is working effectively, you maintain greater control of the image your audiences have of you. This happens through the Marketing Mechanism of Action. Figure 1. 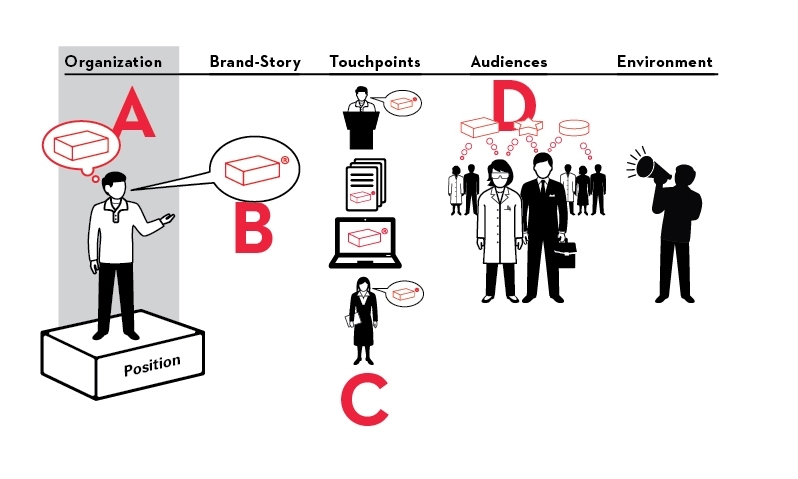 This shows the 5 primary components of marketing, which are (starting from the left) your position, brand-story, touchpoints, audiences and the environment. The image created in the minds of your audiences will affect their attitudes, beliefs and behaviors, both during the buying cycle and at other times. The Marketing Mechanism of Action in life science marketing. These five components (position, brand-story, touchpoints, audiences and the environment) have a very clear relationship as they interact to enable effective marketing – that is, as they combine to influence your audiences’ beliefs, behaviors or actions. I call this relationship the Marketing Mechanism of Action, which I’ll abbreviate MMOA. It works like this:When your marketing is working effectively, the image your audiences have or your organization will match your position. Your audience has an image of your organization, products or services. This image influences their beliefs, behaviors and actions. You change this image by creating and promoting effective touchpoints. To be effective, your touchpoints must express your brand-story consistently. 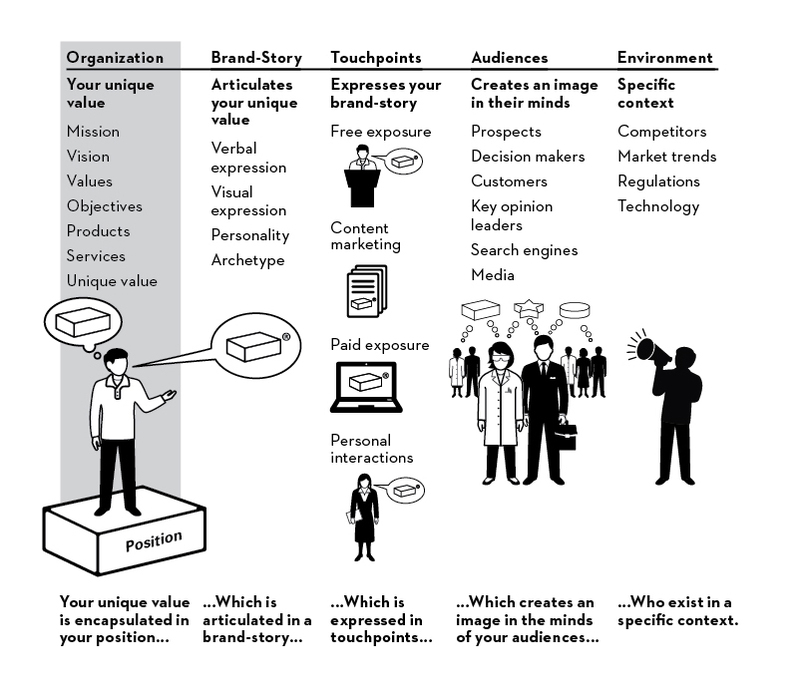 To be effective, your brand-story must be the distilled visual and verbal articulation of your position. Your position must meet the seven key criteria (clear, unique, authentic, sustainable, important, believable and compelling). It sounds simple, doesn’t it? It is, in theory, but in practice it can be difficult to do well. In fact, I’ve written about the different misalignments that can result along the chain of the MMOA. You can read more about those misalignments here. The four meanings of the word brand. With the terminology and relationships from figure 1 in mind, it is important to note that different marketers have defined the word “brand” in four separate, mutually exclusive ways. These are shown in figure 2.The four meanings of the word “brand” relate directly to four of the components of the Marketing Mechanism of Action. Figure 2. Here are the 4 different meanings of the word “brand,” a very confusing term. Rather than using the word “brand,” I will instead talk about your Position, your Brand-Story, your Touchpoints or your audiences’ Image of your organization, product or service. Clear definitions are necessary to create high performance marketing in the life sciences. To facilitate a meaningful discussion about whether or not it’s time to rebrand, let’s replace the word “brand” with the following, more accurate, terminology. Now I’d like you to compare the following two paragraphs. Which one is more clear? A) The MMOA works like this: To market effectively you select a brand that you then articulate clearly both verbally and visually. You then express this brand consistently across your entire brand and this will build a brand in the minds of the audiences. If you do this well, the resulting brand will match the chosen brand, allowing you to influence your audiences’ attitudes, beliefs and behaviors. B) The MMOA works like this: To market effectively you select a position that you then articulate clearly both verbally and visually in your brand-story. You then express this brand-story consistently across all your touchpoints and this will build an image in the minds of the audiences. If you do this well, the resulting image will match the chosen position, allowing you to influence your audiences’ attitudes, beliefs and behaviors. Since there are four meanings to the word that shall not be named, there are also four meanings to the word “rebrand,” as shown in figure 3. Rebranding is such an imprecise term that it can mean A) creating a new position, B) creating a new brand-story, C) creating new touchpoints or D) creating a new image in the minds of the audiences. Figure 3. Here are the 4 different meanings of the word “rebranding,” specifically, a) choosing a new position, b) distilling that position into a clear verbal and visual representation known as your brand-story, c) expressing that brand-story across the entire ladder of lead generation, and d) creating a new image in the minds of the audiences. It’s worth noting that option C, creating a series of touchpoints, can be so extensive that it can be considered a rebrand, or it might be just a campaign. I’ll take a small detour to talk about what a campaign is, and the differences between a campaign and (more complete) rebranding. The 8 foundational assets you must have. The first two are private, that is, you won’t broadcast them to the world. The next six are public. The order in which you create these eight assets is important, as we’ll see in a future issue. Once you’ve got these assets in hand, you can use them to create your touchpoints and enable your audiences to create an image of your organization. In marketing-mature organizations, you’ll find these touchpoints often linked together in a campaign. A campaign is a series of touchpoints deliberately linked by some common elements, aimed at creating a particular set of results (e.g., introduction of a new product or service, increased web traffic and conversions, etc.). Even though some campaigns might last years, campaigns live shorter lives than a brand-story or a position. A campaign is a series of touchpoints linked by common elements, targeted to create a particular set of results. As you’ll see from the table in Figure 4, creating a campaign does not typically involve repositioning the company. While a campaign may necessitate a distinct position, this position does not replace the position of the organization/product/service as a whole. Figure 4. There is a difference between a campaign and a rebranding. This difference is seen most clearly from the foundational elements involved in each. As you can see, a campaign typically involves specific images and specific messages. A campaign may or may not involve a tagline, an identity and a distinct look and feel. The most common meaning of the word “rebranding” in the life sciences. A rebrand should start with a refinement or redefinition of your position. The most common meaning of the word “rebrand” is B from figure 3; that is, a rebranding involves creating a new brand-story. And most marketers interpret this to mean the creation of a new logo or trademark. The result is then applied across the Ladder of Lead Generation. 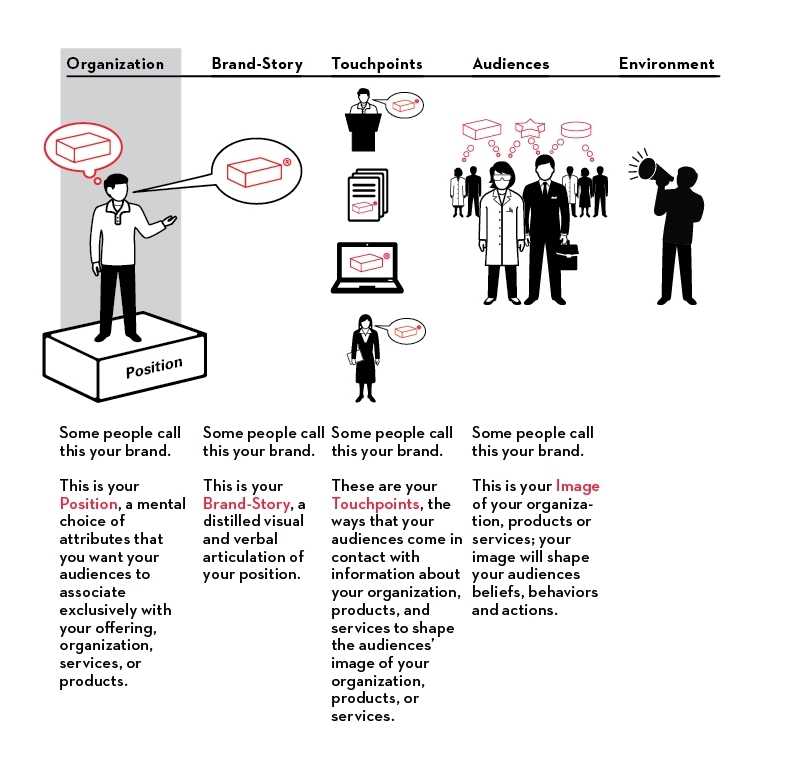 But since your brand-story is the distilled visual and verbal articulation of your position, and since it is fairly common for an organization in the life sciences to have a position that is undefined or poorly defined, it doesn’t make sense to change your brand-story unless your position is being redefined. There are only a very few reasons to change your brand-story while leaving your position intact. These are very rare, but I’ll give you one example: legal action. “Hey, you can’t use that logo—it’s too close to one that is already trademarked.” Absent these rare conditions, if you are going to be changing your brand-story, it’s likely you’re doing so because you’re changing your position. And this works the other way. If you are going to change your brand-story, it’s extremely rare for your position to be so well defined that you don’t also need to take the opportunity to refine your position. Conclusion: A rebranding should be seen as an opportunity to refine your position. One important takeaway from all this is that a rebranding doesn’t start with your brand-story. It starts with your position. So it really ought to be called a “repositioning,” which would involve the development of a new or refined position (which is private), which would then be articulated in your brand-story (which is public). Once again, the common language used in marketing has gotten in the way: most marketers refer to a rebranding (which they interpret as the creation of a new logo or trademark), when they should really be discussing a repositioning (and then a rebranding). Now that we’ve clarified our terminology, in the next issue I’ll examine the reasons why a life science organization would rebrand – there are more than a dozen – and I’ll provide a detailed description of the potential negative consequences of rebranding.